Polypropylene couplings in 1/8" and 1/4" flow. This series of couplings offers most of the same sizes and configurations as the FT-PMC and FT-PLC Series with the addition of materials affording greater chemical resistance. Note: Polypropylene couplings do not interchange with acetal or chrome-plated brass. 참고: * Panel Opening = 1/2" PMC, 11/16" Diameter, Maximum Panel Thickness = 1/2", Minimum Panel Thickness = .020", Panel Nuts = 5/8" Hex PMC, 13/16" Hex , PTF fittings are designed for semi-rigid tubing, i.e.polyethylene, nylon, etc., and polyurethane tubing. 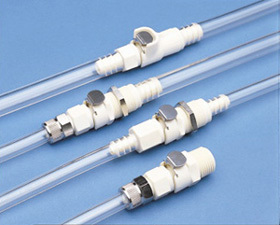 Polypropylene coupling halves do not interchange with other materials.